Stay up-to-date with our latest artificial reef project and design news from around the world. A Los Angeles-based team of film and television designers, dive-site developers, and marine biologists are designing and creating art inspired artificial reefs for resort hotel tourism and the environment in a race to save inshore ocean habitat around the globe. CEO Patric Douglas notes that while scuba diving and snorkeling are a $3-billion-a-year business, most resort hotel developments don’t offer much in the way of special underwater experiences. “Many five-star resorts have one-star waterfronts,” says Douglas. Reef Worlds estimates there are 500,000 square miles of resort oceanfront with limited appeal to adventurous tourists due to rampant habitat loss. “Reef Worlds was established three years ago with the goal of working alongside resort hotels to create sustainable artificial reef systems that help reduce tourism pressures on natural reefs. Reef Worlds art inspired reefs are fully monetized discrete mini-marine “protected areas” within the resort’s own footprint, allowing them to brand the signature underwater experiences of their guests while creating and fostering regional habitat,” says Douglas. Artificial reefs have been around for decades. Most were created with everything from sunken battleships to old tires—and most, says Douglas, are boring. “Who wants to look at a concrete triangle?” he asks. Reef Worlds designs and creates “dynamic reefs” using key regional design cues to attract sea life and tourism interest, making them places people actually want to explore, he says. Douglas says Reef Worlds will be able to bring in projects at 10-20% of the cost of a typical resort hotel water theme park, which can run $70 million to build and $1 million a year to market and maintain. And unlike land based entertainment facilities Reef Worlds artificial reef sites slowly transform over time into habitat for a wide range of wildlife and corals like typical artificial reef structure. Reef Worlds most recent ’“Pearl of Dubai” project will be located in the waters around the World Islands development. Renderings suggest the park might be modeled after the mythic Lost City of Atlantis with Babylonian and Sumerian design cues throughout . 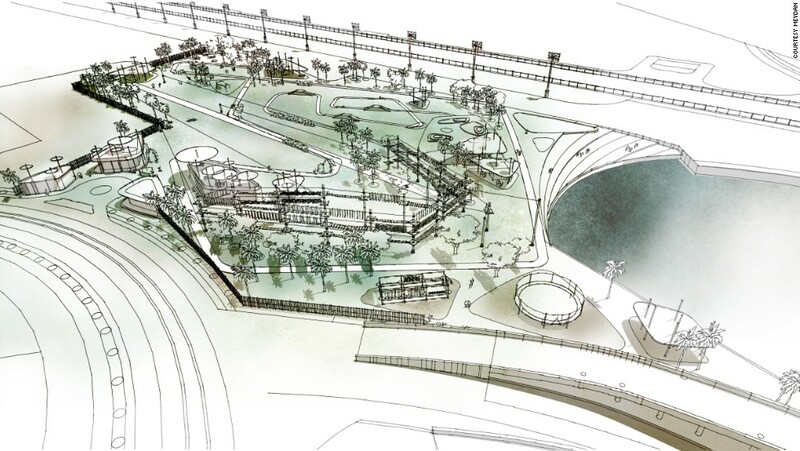 Reef Worlds has five projects in varying stages of development in Dubai, Qatar, the Philippines, and Mexico. “Our goal over the next decade is the rehabilitation of 500,000 square miles of nearshore reefs in need of help,” says Douglas. One might ask why people would take a perfectly good ship, fill it up with water, and put it at the bottom of the ocean. One might also ask why build an art reef at a resort? Irrational hatred of boats? Need to show off their sick marine-engineering skills? Slow day on Snapchat? Love of the marine environment? Well, the answer is simple: artificial reefs work. Anyone who's ever swum through a submerged vessel knows shipwrecks are possibly the coolest thing about diving. Entire ships -- SHIPS! -- that once roamed the ocean, now consigned to the deep. You get to explore a once-functional relic, now the property of eels and sea cucumbers. Some of these vessels arrive by accident, but a good number are also deliberately sunk to become artificial reefs that divers and marine life can enjoy alike. The same is true for art reefs at resort hotels a new trend in artificial reef building and design. But how exactly does someone sink a gargantuan boat with precision, or build an art reef? And what goes into making an artificial reef? One might ask why people would take a perfectly good ship, fill it up with water, and put it at the bottom of the ocean. Irrational hatred of boats? Need to show off their sick marine-engineering skills? Slow day on Snapchat? Well, the answer is simple: wreck diving. Anyone who's ever swum through a submerged vessel knows shipwrecks are possibly the coolest thing about diving. Entire ships -- SHIPS! -- that once roamed the ocean, now consigned to the deep. You get to explore a once-functional relic, now the property of eels and sea cucumbers. Some of these vessels arrive by accident, but a good number are also deliberately sunk to become artificial reefs that divers and marine life can enjoy alike. But how exactly does someone sink a gargantuan boat with precision? And what goes into making an artificial reef? Step 1: Where to put it? Two major considerations go into determining where to sink a ship or build a resort based art reef. Can the public reach it? And what will happen to the environment? Regulations prohibit placing any artificial reef where it could damage an existing reef or the ocean floor. So before even applying for permits, choose an artificial reef company that has years of experience. "The Reef Worlds brand is all about sustainability and the creation of new habitat while at the same time adding instant tourism revenue and excitement to waterfront resorts," says Patric Douglas CEO. To get a permit for an artificial reef, you have to go through the county, the state, and the US Army Corps of Engineers. It's time-consuming and arduous but the team at Reef Worlds knows the process both in the US and around the globe. Art as artificial reefs for tourism and the environment? Are artificial reefs really as “good” as natural reefs? What are the wider social effects of an art installation? Great questions. Of course, to fully and properly answer these questions, social and natural scientists would need to study this system and others like it. However, in their review of the literature on artificial reefs, Bohnsack and Sutherland (1985) summarize how artificial reefs compare to natural reefs. There is a scientific consensus that artificial reefs are “effective fish attractants.” In almost all cases, artificial reefs had similar community structures as natural reefs, and in most cases artificial reefs also had greater fish abundance and biomass than natural reefs of similar size. In the USA, many artificial reefs are constructed of waste materials like coal ash and tires – but this is not ubiquitous worldwide; in Japan, for example, artificial reefs are carefully engineered to boost fish stocks. Particularly in the United States, not enough attention is paid to optimal design, construction, and placement of artificial reefs. Artificial reef companies like Reef Worlds were created to address the gaps in artificial reef design for tourism. "Artificial reefs have similar compositions of organisms as natural reefs given time (in this study, 119 years) as long as the physical structures are comparable (Perkol-Finkel et al. 2006). Finally, a more recent study found that having vertical rather than horizontal surfaces was more important for encrusting organisms than whether a reef was artificial or natural" (Knott et al. 2004). The general consensus about the ecological impacts of artificial reefs v. natural reefs are thus that many artificial reefs are well-planned and have similar (vertical) structure as natural reefs, that artificial reefs can be as good or better than natural reefs at fish recruitment and overall biodiversity (Bohnsack and Sutherland 1985, Knott et al. 2004, Perkol-Finkel et al. 2006). Artificial reefs tend to be used primarily by recreational fishers and divers (in the USA, Australia), artisanal fishers (in the Philippines), or commercial fishers (in Japan).The economic impact can be substantial: a study by Johns and coauthors found that artificial reefs in a single county in southeast Florida produced $962 million in sales, $502 million in income, and 16,800 full- and part-time jobs (Johns et al. 2001). Bohnsack, James A., and David L. Sutherland. “Artificial reef research: a review with recommendations for future priorities.” Bulletin of marine science37.1 (1985): 11-39. Johns GM, Leeworthy VR, Bell FW, Bonn MA. Socioeconomic study of reefs in Southeast Florida—final report. Report prepared for Broward County, Palm Beach County, Miami-Dade County, Monroe County, Florida Fish and Wildlife Conservation Commission and National Oceanic and Atmospheric Administration. Hazen and Sawyer: Environmental Engineers and Scientists, 2001. Knott, N. A., et al. “Epibiota on vertical and on horizontal surfaces on natural reefs and on artificial structures.” Journal of the Marine Biological Association of the UK 84.06 (2004): 1117-1130. Perkol-Finkel, S., N. Shashar, and Y. Benayahu. “Can artificial reefs mimic natural reef communities? The roles of structural features and age.” Marine environmental research 61.2 (2006): 121-135. Sutton, Stephen G., and Sally L. Bushnell. “Socio-economic aspects of artificial reefs: Considerations for the Great Barrier Reef Marine Park.” Ocean & Coastal Management 50.10 (2007): 829-846. Artificial reefs in marine protected areas provide additional habitat for biodiversity viewing, and therefore may offer an innovative management solution for managing for coral reef recovery and resilience. Marine park user fees can generate revenue to help manage and maintain natural and artificial reefs. Using a stated preference survey, this study investigates the present consumer surplus associated with visitor use of a marine protected area in Barbados. Two hypothetical markets were presented to differentiate between respondents use values of either: (a) natural reefs within the marine reserve or (b) artificial reef habitat for recreational enhancement. Information was also collected on visitors’ perceptions of artificial reefs, reef material preferences and reef conservation awareness. From a sample of 250 visitors on snorkel trips, we estimate a mean willingness to pay of US$18.33 (median—US$15) for natural reef use and a mean value of US$17.58 (median—US$12.50) for artificial reef use. The number of marine species viewed, age of respondent, familiarity with the Folkestone Marine Reserve and level of environmental concern were statistically significant in influencing willingness to pay. Regression analyses indicate visitors are willing to pay a significant amount to view marine life, especially turtles. Our results suggest that user fees could provide a considerable source of income to aid reef conservation in Barbados. In addition, the substantial use value reported for artificial reefs indicates a reef substitution policy may be supported by visitors to the Folkestone Marine Reserve. We discuss our findings and highlight directions for future research that include the need to collect data to establish visitors’ non-use values to fund reef management. Coral reefs are of significant economic value to the scuba diving and snorkelling industries (Brander, Van Beukering & Cesar, 2007) and via these water-based activities, reef tourism contributes millions of dollars annually to coastal regions (Dixon, Scura & Van’t Hof, 1993; Cesar & van Beukering, 2004; Sarkis et al., 2013). A majority of reefs are located along the coastal strips of developing countries where people depend heavily on reef ecosystems for their livelihoods (Cesar, 2000; Cesar, Burke & Pet-Soede, 2003; Burke et al., 2011). In St. Lucia and Tobago alone, direct spending by reef tourists in 2006 contributed an estimated US$91.6 and US$43.5 million to each economy, respectively (Burke et al., 2008). More recently, Burke et al. (2011) reported values for global reef tourism at US$50/ha/yr to US$1,000/ha/yr. In Bermuda, Sarkis et al. (2013) calculated the average total economic value of their coral reefs at US$722 million per year, from which US$406 million was related to coral reef tourism. Despite the value of coral reefs to coastal populations for marine recreation, shoreline protection and fisheries production, among others (Moberg & Folke, 1999), global reef decline continues as a result of various anthropogenic activities (Halpern et al., 2008; Smith et al., 2016). Marine protected areas (MPAs) have become an effective means of conserving reef ecosystems from human impacts (Halpern, 2003; Lester et al., 2009), while still allowing for recreational use of resources including scuba diving and snorkelling (Thurstan et al., 2012). Considered by some to be the ‘pinnacle’ in marine conservation (Thurstan et al., 2012), an MPA is defined as “an area of sea especially dedicated to the protection and maintenance of biological diversity and of natural and associated cultural resources, and managed through legal or other effective means” (Department of the Environment, 2013). The last four decades have witnessed a proliferation of MPAs globally (WDPA, 2013). Burke et al. (2011) note that over two and a half thousand marine parks and equivalent protected areas have been designated to conserve coral reef habitats, amounting to 6% of the worlds coral reefs being managed. The many conservation benefits of MPAs are well documented (e.g., Selig & Bruno, 2010; Johnson & Sandell, 2014; Leenhardt et al., 2015), including an increase in the size and biomass of fish species (Varkey, Ainsworthy & Pitcher, 2012; Caselle et al., 2015; Sciberras et al., 2015). As a consequence, biological enhancement typically increases the attractiveness of marine parks to divers and snorkellers (Barker, 2003), though this in itself may cause a dilemma between protection and use of coral reef resources (Thurstan et al., 2012). Being an active scuba diver, I have seen my share of reefs. Some of them have been great with brilliant colors and teeming with marine life, while others have been dead with almost no marine life at all. As a fellow diver, I am certain that you too have had experiences like mine. The majority of scuba divers, that I have met, share my love for reefs and do what they can to protect what they are diving. They take care to ensure that they are not damaging reef nor harassing marine life. It is a reflection of our backgrounds and how we were trained. There are of course exceptions, many dive destination have concerns with divers from certain Asian countries, who do not have the background that recognize the fragility of the underwater world and did not receive the reinforcement of marine protection after training. Even so, overall divers are a ecology aware group. But is it enough? These past few weeks reefs seem to be mentioned every time I have turned around. Thailand has been mentioned in the news for closing a number of dive sites because of the nature of the reef. As reported in an article on this site, Thailand Closes Multiple Dive Sites, The government stepped in and indefinitely closed a number of dive sites. They stated that tourist have damaged the reef to the point that closing the entire area to tourist is the only hope for the reefs to recover. The Thai government has routinely closed sections of marine parks to allow reefs and marine life to recover. Immediately after the military coup a few years ago, the new leaders took steps to become more tourist friendly. One of the first things they did was take over the management of the taxi stands at the airport and enforce fair standards and safety rules. They also went into some tourist destinations and national parks and cleared out squatters and tore down illegal buildings. They cleaned up beaches and took steps to reduce the pollution of the country’s surrounding waters from shore based pollution. After a series of well publicized deaths in the last year related to diving, they also started taking a hard look at the management of diving and water related tourism. The problem, as I see it, is more based on the tour operators that bring tourist to snorkel the reefs or to walk the reefs with helmets or snuba. There are too many operators in Thailand and worldwide that do not share our love of reefs, they just give a few minutes of “instruction” on how to snorkel and let the tourist loose without supervision. As a result the reefs and scuba diving suffer. But tourist and tour operators are not the only enemies of the reefs. The last week of May (2016) coming into the beginning of June has seen a number of international press reporting on massive bleaching of the Great Barrier Reef. The U.K. Based Telegraph printed an article titled “Great Barrier Reef axed from UN climate change report after Australian government intervention”. In that article they claim that the Australian government put pressure on the United Nations Educational, Scientific and Cultural Organisation (UNESCO) to exclude Australia from the climate change and world heritage sites report. That article and many more quote a government report on the state of the Great Barrier Reef. A report put out by James Cook University, which is one of the world’s leading marine science education and research centers, in cooperation with the Great Barrier Reef Marine Park Authority recently released data from a study of coral bleaching of the Great Barrier Reef. In April, federal Environment Minister Greg Hunt said: Coral bleaching on the Great Barrier Reef is “major and significant”. “The event is still unfolding and the full extent and severity of bleaching may take several weeks to manifest,” He said the most severe bleaching had been observed between Cape York and Cooktown on the far northern part of the reef. A more recent quote on the topic is even more frighting to me. “We found on average, that 35 per cent of the corals are now dead or dying on 84 reefs that we surveyed along the northern and central sections of the Great Barrier Reef, between Townsville and Papua New Guinea,” says Professor Terry Hughes, Director of the ARC Centre of Excellence for Coral Reef Studies at James Cook University (JCU). Reading the report itself has even more shocking news. In some sections the damage thankfully is low with less than 5% kill off, but sections near Lizard island are averaging 85% kill off with at least one reef at 95%. The area between Cape York and Cooktown have always been considered pristine reefs, it is in this area that scientist operate from Lizard island studying reef and marine life. It is also where we find the Ribbon Reefs, which are often on the list of the world’s best dive sites. The lost of the reefs goes well beyond divers losing the best dive sites in the world. It will impact our lives themselves. The reefs are in bad condition around the world and many will die. Some of it is due to the direct misuse of humans, some by human pollution and others the result of environmental conditions that may or may not be the fault of mankind. What Can We Do to Help the Reefs? I recently did an article here titled Diving for Art Appreciation. The focus of that article was supporting dive sites created with statues. These sites bring divers to new areas and help create new reefs improving the quantity of marine life. In addition to creating new reefs, these art reefs reduce the pressure on existing reefs by divers. I recently had the honor of talking with Patric Douglas, the CEO of Reef Worlds. Reef Worlds is encouraging hospitality establishments, resorts and hotels, to create underwater attractions in the near shore areas of their properties. One of the things we discuss is that many, if not most, resorts do not do anything beyond the beach area of their resorts. Scuba divers and snorkelers are taken great distances away to visit reefs. Many of these resorts could develop something close to shore that would meet the desires of both divers and snorkelers. They have a few projects underway, The Pearl of Dubai is a five acre dive and snorkel tourism “Lost World” site off the coast of Dubai while the Gods of the Maya is a project in Mexico. Both of these projects are located near the shore and in around 30 feet of waters. The projects will create interesting shapes and be the building blocks of an new reef. The areas will be protected from fishing and given some help getting started. For me that is a win win situation. I rather dive on a 30 foot house reef that is teeming with fish than travel an hour to a overcrowded dive site, then dive for 30 minutes at 90 feet. I can get in more time underwater and still have more time with my non-diving friends. I think we as scuba divers should ask resorts and dive operators what they are doing to help reefs. I also believe we should support those that are helping with our business and shame those that do not support reef protection. Each of us should do something, no matter how small to preserve the reefs. Without them we will find our sport becoming boring but more importantly we will see our food sources disappearing. Reef Worlds, a Los Angeles-based underwater tourism design company, has submitted the final design for the world’s largest sustainable underwater tourism site in Dubai, which will now have a Hamour Habitat, as well, 'Emirates 24|7' can reveal. “The ‘Pearl of Dubai’ project is in final design phase with the client. We have submitted our last rendition of the proposed site and unique Hamour Habitat for their internal review and waiting on design approval,” company CEO Patric Douglas told this website. The Environment Agency Abu Dhabi had said earlier that Hammour is on the endangered list after been over-fished seven times the sustainable limit. The company did not reveal the location of the project on The World, an artificial archipelago of over 300 islands, citing non-disclosure agreement signed in 2013/14. Douglas said Nakheel, master developer of The World islands, has not approved the project and "will not until they see final design approved by our client". There has been five draft revisions since the company first announced the project in 2014, the official said, emphasising the site has unique regional design influences and is a major habitat center for regional wildlife. 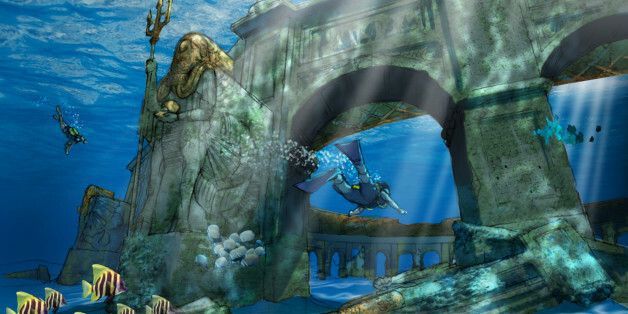 In 2014, Reef Worlds said the park will be modeled after Atlantis, the mythical lost city, and is inspired by Hollywood films ‘Pirates of the Caribbean’ and ‘Avatar’. Los Angeles-based Reef Worlds are designing the world’s largest sustainable underwater tourism site in Dubai and others across the United Arab Emirates (UAE). The underwater tourism design company has recently completed designing a revolutionary five-acre tourism site that will allow select waterfront resort development partners the ability to capture a global US$ 3 billion dive and snorkel market.The unique site is being designed to look like an ancient Lost City. Reef Worlds entertainment team have designed for blockbuster movies like Avatar and Pirates of the Caribbean. That’s the question a group of Los Angeles film set designers, divers, and marine biologists asked prior to creating a revolutionary underwater tourism company - Reef Worlds. The idea was simple. Take the concept of an artificial reef, typically rock tailings, rip rap, and or concrete shapes that had no tourism value and fundamentally redesign the concept to create entire worlds underwater for tourism. Reef Worlds harness 5000 years of human design elements and a Ph neutral build matrix with a touch of Hollywood magic to deliver underwater experiential sites that could capture and hold mass tourism within a resort developments own footprint. The concept of a resort art reef can be a puzzling one. Nonetheless, the potential benefits of developing one possibly extend beyond the inevitable tourism draw. Los Angeles-based Reef Worlds, which is currently working on a one-of-a-kind theme park marine sanctuary in Dubai, was essentially founded on the benefits this type of investment can have on nature and conservation efforts. "My team and I were lamenting that at every hotel resort we went to in the Mediterranean and Mexico, the near-shore reef system was just gone, like a nuke went off," says Reef Worlds founder Patric Douglas. "So the question became, what can we do to rehabilitate that, and what's the tourism angle?" "All of these resorts are 200 feet from the ocean, but have nothing to do with the ocean." The allure of diving is effectively the tourism angle when it comes to an underwater resort. With coral reefs vanishing quickly, tourists can't travel to just any coast or island to see them anymore, thus making them a key asset for competing hotels and resorts. That's where companies like Reef Worlds come into play. They are constructing artificial reefs that not only to attract more tourists, but serve as a makeshift habitat for rare and popular underwater species. So the potential benefits of development extend beyond simply generating tourism dollars. Douglas points out that since the people and the communities in and around many hotels and resorts rely on tourism to survive, they are more inclined to protect the surrounding environment that's helping to bring in those guests. Once given the opportunity to experience nature up close at an underwater resort, guests are then more likely to value the often overlooked ecosystems. "Once people have a more authentic experience, and engage with a reef on a fundamental level, it changes their whole focus and attitude," Douglas told Smithsonian.com. Although underwater lobbies and guestrooms haven't yet become commonplace, in order to make underwater hotel concepts a worthwhile venture, there must first be a reason why guests would want to go underwater. As Douglas told Smithsonian.com, "to save a thing, you have to put money into it, and the best way to do that is charge people to go see it." With the economic value of coral reefs in the U.S. and its territories exceeding $200 million annually, according to a 2013 report from the National Oceanic and Atmospheric Administration, there's a clear demand for underwater attractions. Capitalizing on that demand could benefit not only well-positioned hotels and resorts, but ecosystems and the local communities and economies that often rely on them. For 15 years, I served as the CEO of Shark Diver where we pioneered cage-diving with great white sharks. We were the first commercial shark diving company in the U. S. to initiate, develop, and support research of white sharks at Isla Guadalupe in Mexico. We went on to initiate strong global shark conservation programs like the Shark-Free Marinas Initiative in tandem with our operations sites in the Bahamas. The goal was clear: be advocates for sharks and the diving industry, while providing exciting, but safe shark encounters to our divers, the mainstream media, and research partners. We called it Conservation Shark Diving. TROUBLED by what it describes as half-star waterfronts at several resorts around the world, including the Caribbean, Reef Worlds has designed a plan that will see it pumping US$4.5m into recreating marine habitats in the region. Mike Wallace, director of development at Reef Worlds, didn't reveal the names of the resorts with which it is seeking to partner on the project, but said it is currently in talks with "two well-known all-inclusive resort chains". He expects to have 10 to 15 on board by the time the building wraps up at the end of 2014. "Our team was shocked," Wallace said after reviewing the state of resort waterfronts. "We discovered five-star properties with half-star waterfronts. Zones beyond the high-tide mark where natural reefs, colourful fish, and habitats were, are essentially gone, replaced with some old tyres, turtle grass and dead coral, and this was a global phenomenon." The plan, he told the Jamaica Observer from his office in California, is to identify resorts that have an ecological track record and good environmental stewardship and give them funds to create underwater worlds featuring snorkel trails, scuba-training sites, coral propagation, etc. The resorts, in turn, will monetise the sites and put a percentage back into the development of environment tourism. He explained that each site will be different, as it will be directly tied into the resort's own footprint. Reef Worlds is an underwater tourism development firm in the US with a team of marine biologists, reefologists, as well as designers who have worked on the Hollywood blockbusters Lord of the Rings, Avatar and Pirates of the Caribbean. It uses eco-friendly materials, which include local rock and ancient coral beds, in its made-to-order structures. "There are no down sides to the creation of dynamic reefs when you have a great team of marine biologists and designers who treat the regional environment as their first clients," Wallace said in response to a question about the environmental impact of his company's underwater creations. On the subject of financing, Wallace said: "Reef Worlds has a substantial development budget to bring these unique and iconic dynamic reef systems to our resort partner at no up front cost. It's pretty much unheard of in the resort and development space -- a tourism design-and-build company that is so confident that these sites promote the best of sustainable tourism and a boost to regional wildlife that they are willing to invest millions in the projects". "So confident are we in our ability to fundamentally change the environment that we are willing to put five million of our own money into it," he told the Observer. His decision to pursue projects in the Caribbean seems timely, given the region's push to mitigate the effects of warming oceans, rising sea levels and the disappearance of certain marine species. In 2008 the region launched the Caribbean Challenge Initiative with support from The Nature Conservancy and made commitments to conserve at least 20 per cent of their nearshore marine and coastal environments in national marine protected areas systems by 2020, and to create national conservation trust funds. A week-and-a-half ago a new phase of the challenge directed at accelerating conservation action and funding took effect when head of Virgin Atlantic Richard Branson hosted Caribbean political and business leaders at a summit on Necker Island, his home in the British Virgin Islands. The Caribbean has 10 per cent of the world's coral reefs, 1,400 species of fish and marine mammals, and miles of mangrove forests, but they are increasingly under threat from events like over-fishing and coral bleaching. "The region accounts for 40 per cent of coral bleaching," Wallace said. "Habitat loss is at the highest point it's ever been...Resorts spend millions of dollars on their landscaping but don't spend any on their waterfront garden...It's a US$20-billion enterprise and a lot of those tourists want to sea colourful reef and fish." "To be at the head of what will soon become one of resort and development's key tourism offerings is an exciting place to be. The fact is they have run out of land-based development space and have forgotten their waterfronts as a place of engagement and branding. Most resort chains sub-contract out even basic snorkeling to third parties. We're bringing that all back to 40 years ago when once-pristine reefs were as close to a Caribbean resort as a snorkel from the beach. "Colourful wildlife has not gone forever," he reassured. "It just needs the right habitat to come back. And we're building it, one iconic and unique site at a time. US-based company Reef Worlds has been transforming the holiday experience at a number of resorts recently in a very unique way. Designed by divers and created by design teams who have worked on Hollywood blockbusters including Lord of the Rings, Avatar and Pirates of the Caribbean, Reef Worlds’ unique green ‘ocean structures’ are giving beachfront resorts an added wow factor – underwater. The Future World Summit, being held in Dubai, UAE, in December will focus on the growing importance of underwater projects in the Middle Eastern tourism market. Recent developments in artificial reefs and other underwater attractions are set to become an important part of the Middle Eastern travel and tourism market, as countries in the region begin to get serious about entering the $3 billion dive and snorkel marketplace. “Reef Worlds addresses a critical problem cities, such as Dubai, have with the lack of water-based tourism or footprint in the global dive and snorkel marketplace. In the waters in and around Dubai there are few, if any, underwater engagement points,” said Patric Douglas, Reef World’s CEO. “Resort developers along Dubai's expanding coastline are now realising that with the creation of Dynamic Reefs, unique sites that are designed for habitat and tourism, they can increase revenues, client satisfaction and give a much needed boost to degraded regional habitats,” he added. Douglas will be involved in the Future Tourism Summit which will be held in Dubai on December 9 and 10. At the event, he will also update delegates on the development of the recently announced The Pearl of Dubai project. Design work has now been completed on what will be the world’s largest underwater theme park, with the five-acre park modelled after the mythical lost city of Atlantis and inspired by the look of recent Hollywood films. In addition to its Dubai development, Reef Worlds has also received interest for similar projects in Qatar and Saudi Arabia, while Oman and Bahrain have already made huge investments into artificial reefs. Underwater Tourism The Next Big Thing? Plans for an underwater theme park in Dubai based on the Lost City of Atlantis have been announced. Los Angeles-based underwater developer Reef Worlds made the official announcement last week. The company designed sets for blockbuster movies like Avatar and Pirates of the Caribbean. The park called Pearl of Dubai will cover five acres near the unfinished World Islands development which has already caused major environmental damage to the reefs which have survived the vast building project in the area over the past 20 years. 'The UAE has a unique tourism problem that we address. When one considers Dubai and the region, scuba diving and underwater exploration is not on the Top Ten list, and yet it is almost everywhere else in the world,' said David Taylor, director of development for Reef Worlds. 'The Reef Worlds brand is all about sustainability and the creation of new habitat while at the same time adding instant tourism revenue and excitement to waterfront resorts,' he said. The company is also working on a similar project in the Philippines. Robot dinosaurs, Lego men and Spider-Man -- all could become Dubai's newest residents as the city is set to house a slew of new theme parks. On the roster is everything from big brands like Legoland and Six Flags, to new concepts set to make a splash. Literally in the case of Pearl of Dubai, slated to be the world's largest underwater park when it's completed (the tentative date is 2020, to correspond with the Dubai World Expo). A number of Qatari resorts are planning to create artificial reef sites that look like ancient “lost cities”, it has been reported. Los Angeles-based Reef Worlds told Gulf Times it was in discussions with two Qatari resorts to restore regional reef habitat off the coast in a bid to create a diving and snorkelling attraction. Who needs to stand in lines at theme parks when you could dive deep into an underwater theme park? Developers have announced plans to create The Pearl of Dubai, a five-acre underwater wonderland inspired by the "Pirates of the Caribbean" and "Avatar" films. When finished, it'll look similar to the legendary lost city of Atlantis. Visitors to the park will have free reign of the massive underwater empire. They will swim, snorkel or, best of all, scuba to its depths and mimic the adrenaline rush of discovering a forgotten kingdom. The five acre theme park will be location in the shallow waters off The World Islands and has been designed to look like an ancient lost city like Atlantis. It had been designed by teams that were involved in the Hollywood hits "Avatar" and "Pirates of the Caribbean." The park will be open to guests of all ages and will give them an opportunity to explore stunning underwater scenes through scuba diving or snorkeling. Can Artificial Reefs Save Resorts? Gone are the days when a visitor to a Caribbean resort can walk out on a near-shore snorkeling tour and see coral reefs teeming with life. Today, that excursion usually involves a lengthy boat ride. But hotels at tropical resorts are still trying to one-up each other in the battle royale for tourism dollars: the swimming-pool wars of the 1980s and 1990s gave way to full-blown water parks like Bermuda’s Atlantis, yet the resorts themselves seemed to completely ignore their offshore assets, Douglas observed.